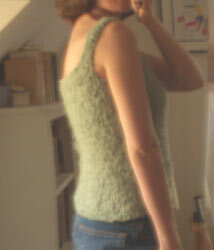 A tank that's as green as the spring, as fluffy as can be, and as easy as pie to knit. Cast on 86 stitches. Join to work in the round, place marker to mark beginning of round and knit straight for 14". Starting at the beginning of the round, bind off for armholes as follows: K34, bind off next 16 stitches for first armhole, K27, bind off 16 stitches for second armhole. You should now have 27 stitches on each side of the armholes. Cast on for straps as follows: knit next 26 stitches, cast on 22 stitches over the bound off armhole stitches (using backward loop method or turn work in order to use knit-on cast on then turn back to RS), join to other side, knit next 27 stitches, cast on 22 stitches over the second armhole in same manner. You should now have 98 stitches and can rejoin to knit in the round again. Next round: K26, K2tog, K20, K2tog, K25, K2tog, K20, K2tog. Knit 6 rounds and bind off all stitches. Bind off loosely over the straps so they still have some stretch and more snugly over the straight sections, so the top won't be too x-rated if you have to bend forward. Wink, wink! 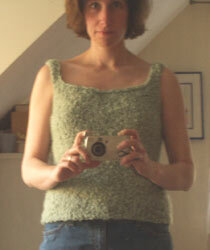 Coming soon: a spring fling top, for those who prefer less skin and more knitting!